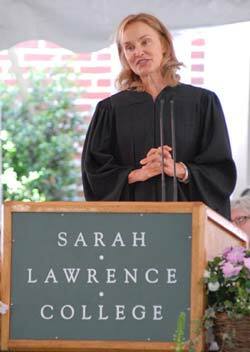 On Friday, May 23, 2008, Jessica Lange was the commencement speaker at her daughter Hannah Shepard’s commencement from Sarah Lawrence College in Bronxville, New York. When I mentioned to a friend that I was writing a commencement speech, he asked me what my theme was. Now that really threw me. Nobody told me I needed a theme. I’m not great with themes, so I don’t have one, per se. I hope you’re not disappointed. I do wish I could be funny or profound; however, that’s wishful thinking. What I have are some thoughts I’d like to share with you. So if it feels random, it probably is.I look out at your faces and guess most of you graduates are about 22 years old. I think of the world I was living in at that age. Very different from yours and yet, ominously similar. At 22, for me, the Vietnam war was in its seventh year. Nixon was employing round-the-clock bombing. We were destroying the infrastructure, the people, and the countryside of Vietnam to save it from the Communists.History repeats itself. We are all citizens of a troubled world, yet it is your generation that carries the weight of the future on your shoulders. We are living in an America that in the last seven and a half years has waged an unnecessary war, established prison camps, condoned torture, employed corporate armies, eliminated the right of habeas corpus, practiced extraordinary rendition, and believe me, this is only a partial list-I had to keep myself in check. I don’t wish to dwell on the misery caused by this administration, but that legacy is being passed down to you. It is a heavy burden to inherit and will require tremendous dedication and hard work to put it right again. You must determine if we are going to measure ourselves on the basis of military might and economic power or if there is perhaps something deeper-more essential in our national character-that needs to be awakened. I believe you’ve come of age in a complex and confusing time. The commercial forces surrounding you, the absence of meaningful culture, the constant assault by media, fashion, and entertainment. We have become a society that is placated by gadgets, soothed by consumerism and the empty rewards of upward mobility, the celebration of mediocrity and false celebrity, the obscurations of modern life. We need a sea change. So, I encourage you not to buy into it. Defy conventions and what is expected of you. Create your own definition of success. Don’t let it be judged or guided by someone else’s measurement, by someone else’s expectations or limitations. You are our hope. So cherish this time in your life. Remember who you are. Because, right now, you have it all: The power of your imagination, the velocity of your dreams, the language of innocence, and the passion of a beginner. Don’t lose it. Don’t let it evaporate or get stripped away or worn away. And, as time passes, if you find you’ve come far away from yourself, allow the breeze of humility to remind you of who you were-who you really are.